Native Instruments is an impressive company design-wise, as might be expected from this Berlin-based company. From their packaging to their manuals to their products, good design is kept at the fore. It looks beautiful, and looks easy to access and use. From experience with other NI products, I know the “feel” of the knobs and buttons is wonderful, too. The interface is interactive, with subtle lights that react to your touch. The Audio Kontrol 1 is a flexible controller, and all of the parts are user-assignable to different functions in different audio programs. 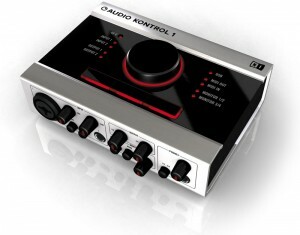 Should be a powerful tool for making music, and all for under $300. And it looks like they even went through the effort to take a great product photo, with a real reflection (very rare these days! ).